Selah seeks to capture heart of your day. Selah begins the story of your most special day. Carry your monogram from beginning to end! 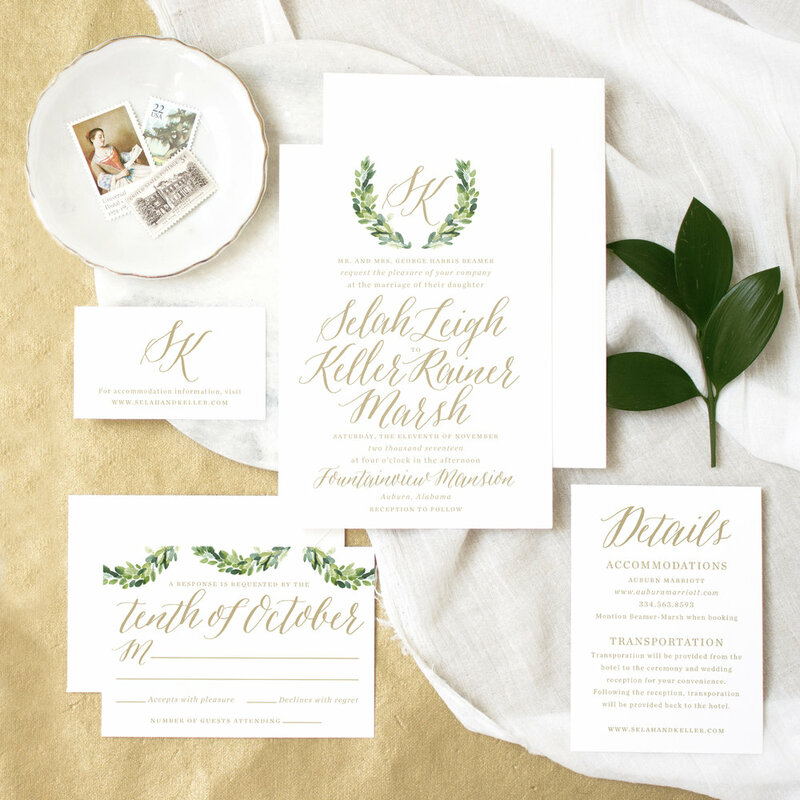 Selah is a complete suite, from save-the-dates to thank you notes and everything in between. You have the flexibility to order piece-by-piece, giving you control of your timeline as well as quantities to fit your needs. You may also place orders at different stages of your engagement. Need save-the-dates now, but not quite ready to start the invitation process? Come back and visit us when you're ready to begin the next phase! We will hold all of your previously designed pieces so we can pick up where we left off. We've served many clients over the years, and one thing is certain. Every couple needs options when it comes to paper. Our Selah suite is built to accommodate! We have two formats for save-the-dates and response cards. Choose an enveloped card, or postcard for either of these pieces! Selah, and all of our collection suites, is digitally printed on 120 pound or 240 pound eggshell finish paper in bright white or ivory. Choose your ink color from our select color palette. Bright white or ivory pointed-flap envelopes are included with invitations, enveloped save the dates, and response cards. Select pieces needed, and complete information forms before checkout. Two rounds of proofs for small tweaks are included in your pricing!